The upper Nile river valley between Abydos and Abu Simbel has been inhabited for at least 6000 years. It draws a large number of tourists due to the abundance of historical sights and its impressive monuments and temples. Luxor is the major tourist centre of the area and can be used as a basis to explore the entire region. 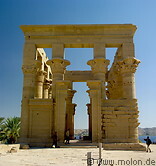 Luxor itself has a large number of temple and archaeological sites. Further north lie the temples of Dendera and Abydos, which can be visited as a day trip from Luxor. Further south lie Assuan and Abu Simbel, which also offer impressive sights. Many tourists opt for a cruise on the Nile river, either on a cruise boat or with a felucca. 28 photos of the temple of Hatshepsut, also known as Deir el-Bahri. 104 photos of the town of Aswan, the Nile river, the High Dam, the Nubian Museum and more.